Come to biology by way of an undergraduate in mathematical physics, I believe that ecology is now where physics was two centuries ago. I'm interested in applying quantitative tools to ecological questions, particularly those associated with where the individual meets ecology. I began as an Assistant Professor in Natural Resource Sciences at McGill in January 2015. Photo by Kerry Woo. Curiosity and birdwatching have led me to the world of Ornithology. I study the correlation between the age of black-legged kittiwakes and the pentosidine levels in their foot webbings. Fortunately for me, this research includes both the excitement of the field and the comfort of the laboratory work. 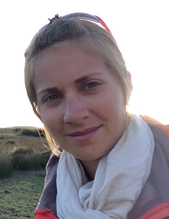 Amélie did her MSc at UQAM (supervised by Jean-François Giroux), studying population dynamics of waterfowl. Switching from an abundant bird population to threatened mammal populations, Amélie will bring her knowledge on population dynamics, conservation and management to help to increase our understanding of bat populations of Quebec. Co-supervised by Anouk Simard (Minister of Forests, Wildlife and Parks), this PhD project will examine aspects related to demography, reproductive success, and reproductive energetic constraints facing Myotis species in Quebec with a pinch of citizen science. 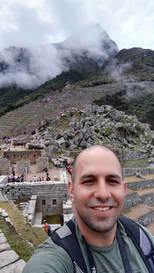 ​Esteban joins us from Bogotá, Colombia after completing his undergrad at Universidad de los Andes with a double major in biology and microbiology. 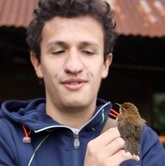 He will be co-supervised by Lyle Whyte (McGill), and he will work on various aspects of the relationships occurring between birds and their microbiome with a special focus to bird’s diet preferences and differential levels of mercury present on bird tissues. Kristen Lalla MSc student (started Sept 2018); cosupervised with Kevin Fraser (U Manitoba). Kristen is studying purple martin populations around Montreal. 90% of martins have disappeared with Quebec, with the final remnants left near Montreal, and Kristen will help find out why. 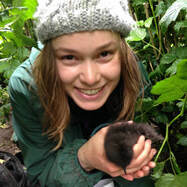 Previously, Kristen was an Environment (Biodiversity and Conservation) Honours student with a lifelong passion for birds. 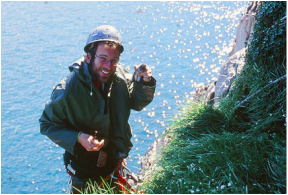 During summer 2017, she was on Middleton Island, Alaska, studying Black-legged Kittiwakes. She looked at age-related differences in foraging behaviour and muscle regeneration, specifically, satellite cells. Don-Jean Leandri-Breton PhD student (started: Sept. 2018). ​Don-Jean did his MSc degree at UQAR (supervised by Joël Bêty) on transatlantic migration strategies and habitat-driven predation vulnerability in Arctic shorebirds. Since his first field season up North in 2013, he couldn’t imagine spending summer anywhere else than above the Arctic Circle. 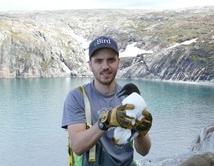 His PhD research (co-supervisor: Olivier Chastel, CNRS-France) will bring him to Svalbard (Norway) to study seasonal interactions between non-breeding behaviours and breeding success mediated by stress-induced carry-over effects in a long-term monitored kittiwake colony. Thomas joins us from Alsace, France. He brings an expertise in modelling the distribution of path lengths in animal movement, which he has previously used to study ants and seabirds. 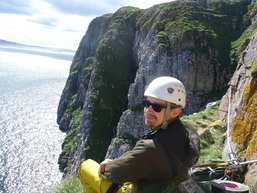 He is funded via MITACS and CREATE scholarships and his dissertation (co-supervisor: Grant Gilchrist) will involve deciphering why and how breeding murres move in the Canadian Arctic, and how that might intersect with shipping of iron ore from the Baffinlands mine. 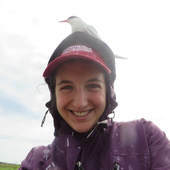 Allison did her MSc at the Roby lab studying feather CORT and movement of Caspian Terns. 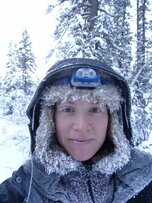 She has spent several years as a field technician studying seabirds, seaducks, shorebirds and songbirds in the Arctic, Texas, BC, Washington and the Alaskan Panhandle. She is funded via MITACS and CREATE scholarships and her dissertation (co-supervisor: Grant Gilchrist) will examine carry-over effects and linkages throughout the annual cycle in thick-billed murres equipped with year-round depth, light and acceleration loggers. She is particularly interested in times and locations when populations are particularly vulnerable to oil pollution. Rebecca joins us from Pennsylvania, where she completed her MSc in Biology at East Stroudsburg University studying the nesting ecology of broad-winged hawks. Rebecca is funded via the CREATE scholarship and is co-supervised by Jean-François Therrien (Hawk Mountain Sanctuary). 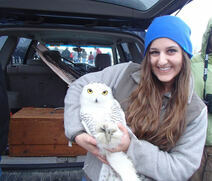 Her PhD work will assess the movements, habitat use, and habitat selection of irruptive snowy owls. Ana completed her undergrad at McGill with a Major in Environmental Biology. She spent the next two years doing field work in Ecuador, studying endemic land birds in Galapagos and hummingbird physiology in the Andean highlands. 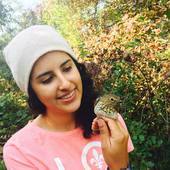 Her MSc thesis is co-supervised by Barbara Frei from the McGill Bird Observatory and she will be studying the migration and stopover ecology of moult migrant Swainson’s thrushes in Montreal using the Motus Wildlife Tracking System. Francis is joining our lab from Lima, Peru. He has a degree in biology from Universidad Nacional Agraria, La Molina and a master’s from California State University, Northridge where he did research on ecomorphology of boobies in the Pacific. He has worked for several years in the Peruvian Marine Research Institute on top predator ecology along the whole Peruvian coast. He has also been an instructor in science and ecology courses in Peru for Broward College. Francis will work on his PhD doing research on endemic seabirds in Peru (cormorants, diving petrels) trying to understand their foraging patterns and diet composition changes associated to environmental disturbances along the Upwelling Humboldt Current System. Shannon completed her MSc at uOttawa (co-advised by Julie Morand-Ferron and Ryan Norris), studying how temperature influences timing of breeding and reproductive success of grey jays. Her PhD work will examine individual variation in foraging behaviour in two Arctic seabirds: black-legged kittiwakes and thick-billed murres. She is using GPS-accelerometers to “spy” on the daily activities of these birds in order to see how they respond to environmental change. She is working as a research technician here until starting a PhD in September. I’m an Environment student specialized in water ecosystems. I am passionate for everything related to aquatic ecosystems! For my Honours thesis I will be building off previous research on the exposure to mercury and other contaminants of ospreys in the Canadian Northwest. Andrea is currently completing her undergraduate degree in Environmental Biology with a specialization in Wildlife Biology. She has always had a great love for the outdoors and especially for observing and studying wildlife. For her Honours thesis, co-supervised by Rebecca McCabe, Andrea is studying the spring migratory behaviour of Snowy Owls using GPS data provided by Project SNOWstorm. Emma was thrown headfirst into the world of ornithology during the summer of 2018, when she headed to Cambridge Bay, Nunavut to work with Polar Knowledge Canada. She is currently completing her undergraduate degree in Environment with a specialization in Biodiversity and Conservation and a minor in GIS and Remote Sensing. Her honours thesis (co-supervised by Jean-François Lamarre of Polar Knowledge Canada) explores the migratory behavior of American Golden-Plovers in relation to weather patterns. 2015. Juliana Balluffi-Fry (Undergrad project) completed an undergraduate research project on the diversity of birds at Kenauk Nature Reserve, along the Ottawa River north of Montreal. Following a field semester in Panama, she is now doing an Honours thesis looking at mammal diversity at Kenauk. 2016. Catherine Jarjour (Honours project, Environmental Biology) cured her Irritable Owl Syndrome by completing an Honours thesis on temporal trends in bird abundance at the McGill Bird Observatory.​ She is starting a MSc thesis at UOttawa with Jule Marond-Ferron. 2016. ​Emma Nip (Undergrad project) completed an undergraduate research project on mass variation in black-capped chickadees at the McGill Bird Observatory. She is now doing a MSc in Animal BioSciences at Guelph studying animal welfare with Georgia Mason. ​2016. Catherine Villeneuve (Honours thesis, Environmental Biology) Catherine used her ninja karate skills to attack a mound of data collected on thick-billed murres at Coats Island. She examined different ways of automatically converting accelerometer data into ethograms based on validated (videotaped) data. ​2017. Amanda Smith-Stasinopolous (Undergrad project) ​After completing an internship volunteering with a sea turtle conservation organisation in Greece this past summer, Amanda realised that she needed more a hands-on experience with field work data analysis. She evaluated the massive data set on at-sea behaviours of black-legged kittiwakes from the Middleton, Alaska field site to examine the fascinating relationship between environmental change and animal behaviour. 2017. ​Casey Leung (Honours thesis, Life Sciences) Casey is an aspiring vet whose thesis was co-supervised by Barbara Frei (Director, McGill Bird Observatory). She tested the utility of point-of-care devices to measure the health of wild songbirds, especially wintering/late migrating juncos, American Tree Sparrows, goldfinches, chickadees, House Finches and robins. ​2017. Erin Brown (Honours thesis, Environmental Biology) Erin completed an undergraduate degree in environmental biology with a specialization in wildlife. After having spent the last two summers tree planting, she was happy to be out of the woods and learning about a new environment, including traveling to Alaska for field work. For her honours thesis she used multiple data sets provided by Dr. George Divoky of Cooper's Island, Alaska. She studied the energetics of prey switching by black guillemots, hoping to quantify the depth and time at which this event occurs. 2017. Megan Phillips (Honours thesis, Environmental Biology) Megan completed her undergraduate degree in environmental biology, specializing in wildlife biology at McGill. Her honours thesis was co-supervised by Barbara Frei of the McGill Bird Observatory and aimed to optimize the placement of the MOTUS tower to detect bird migration of passerine species. This experience helped her spread her wings so that she can migrate to her next destination, which is currently working at the Ecomuseum. 2018. Katelyn Depot (Undergraduate research project) Katelyn completed her undergraduate degree in Environmental Biology (Wildlife Biology Specialization) at McGill. She spent part of the summer of 2017 working with seabirds in Maine as a research assistant for the National Audubon Society's Project Puffin. For her senior research project, she used data collected by Project Puffin to look for relationships between puffin diet composition and changing fish communities in the Gulf of Maine. 2018. Eric Ste Marie Honours thesis (Environmental Biology). Eric was an undergraduate student in Environmental Biology (Wildlife specialization). After having spent July 2017 doing fieldwork in East Greenland, he completed doing his Honour's thesis in our lab on the topic of seabird energetics. His project involved combining accelerometer data and estimates of daily energy expenditure to determine the costs of diving and flying in dovekies. 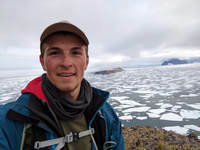 He is now doing a MSc with Nigel Hussey (University of Windsor) studying Greenland sharks. 2016-18. Emile Brisson-Curadeau MSc. Emile completed a MSc on coloniality in murres, publishing this and this and this. Why? Here is what he had to say: When you have ornithology as a passion, what better place to enjoy it than in the ever-impressive Arctic environment? That is the reason why I chose to do my MSc on Thick-billed Murres... and because... you know, who doesn't want to see polar bears? Coats Island will be my study area for the next two years, where we will use cutting-edge technologies to record all the facets of those fascinating diving birds. 2015-18. Natalie Thimot MSc. Natalie joined us from Nova Scotia, after doing her undergrad at Universite Sainte-Anne and Dalhousie. She was co-supervised by Rodger Titman (McGill) and Shawn Craik (Universite Sainte-Anne), and examined correlates of conspecific brood parasitism in red-breasted mergansers in New Brunswick. You can read about her work here. 2018. Mathilde Guglielmi Honours student, MSE. Mathilde first discovered birdwatching as a young child in France, when she was bored one summer and decided to borrow her grandpa's binoculars and explore her backyard. Several years later she rediscovered this passion when interning at the McGill Bird Observatory. Mathilde studies in the McGill School of Environment with a specialization in biodiversity and conservation and a minor in geography. She completed an Honours thesis at the McGill Bird Observatory building on Megan's work, and working closely with Ana, examining the factors influencing the detectability of transmitters within the automated radio network.